A few Android handsets so far have had fingerprint scanners, but with Android M set to standardise the technology, you can be sure we'll see a lot more. Trouble is, as it's a new feature none of the Nexus phones currently have one, so in order to demonstrate it Google has had to add one to the Nexus 5, a phone which was killed off before its time. Sadly this is just a tech demo, not a product you can actually buy. The closest you can get is in the Google Developers video below, which at around 2:26 shows the existence of a Nexus 5 with a fingerprint scanner on the back. Could this be a sign that Google is planning to relaunch the Nexus 5 with added scanning skills? Probably not. But it should, because while it's a little bit dated the Nexus 5 is still a great smartphone and it complements the Nexus 6 brilliantly. Not everyone wants the massive 5.96-inch display offered by Google's phablet and nor does everyone want to pay the steep approximately £450/$600/AU$800 asking price. In fact we'd go so far as to say that a lot of people probably don't want a phablet. As popular as they are they're still not as common as smaller screen phones, so giving the only available Nexus device an almost 6-inch screen seems a little bit much. The price is a big issue too, as along with access to stock Android and speedy updates, relatively low prices have often been a key selling point of Nexus devices - another thing not offered by the Nexus 6. 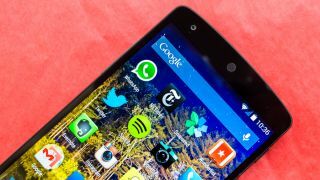 With its 4.95-inch screen and slightly inferior specs the Nexus 5 is both smaller and cheaper, while still providing users access to the latest and greatest version of stock Android. Or it would be if you could still buy it. So Google, if you're listening, make your next Nexus more like the Nexus 5 - or at least give us the option. It's rumoured that there'll be both 5.2-inch and 5.7-inch Nexus handsets launched later this year, and right now we really hope that's true. At least Sony still makes compact phones.